Some of my highlights from the shows that were presented on Day 2 of New York Fashion Week - Ready to Wear Spring/Summer 2015 collections. Mara Hoffman's collection has featured some of my favorite pieces so far this week in New York. The fabrics were kept light, airy and perfect for the warmer months. I loved the embroidered detail that featured on a lot of the pieces. The color palette used was also right up my street, with a base of overall neutrals and then subtle hints of colour running throughout to add detail. I really loved this collection and would love to own some of these pieces in my wardrobe, especially a co-ord shin length skirt and matching top piece that was shown (above, middle). 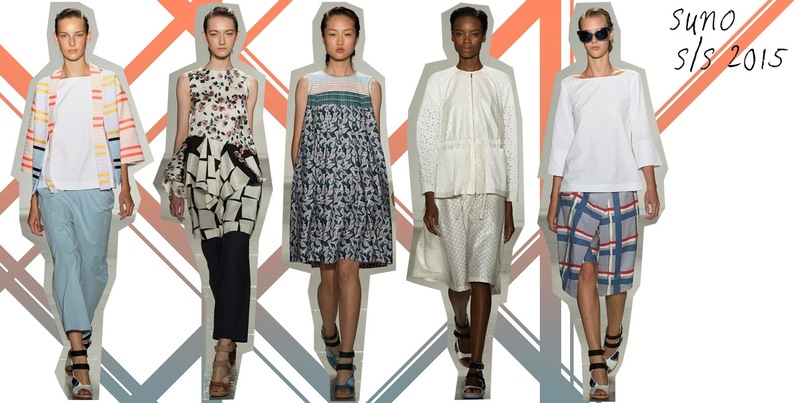 The Suno Spring/Summer 2015 collection, to me, was quite graphic designed based with the patterns and shapes used. The bold floral prints and the use of graphic lines, creating a bold patterned detail. I liked the way the prints were placed onto quite simple cuts and styles, meaning although the prints were quite bold they weren't overpowering or created designs that were too extravagant. Overall, it's definitely a collection that had a lot of great pieces and a very nice design base to it. 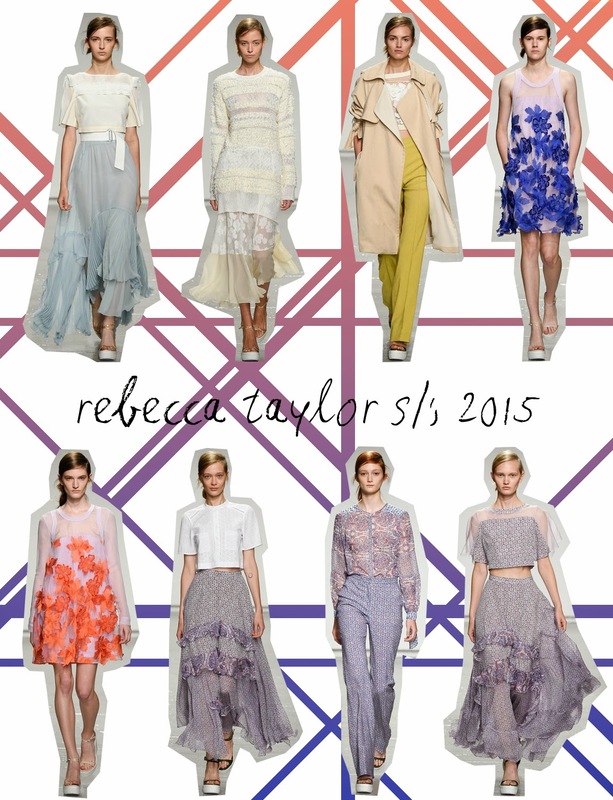 I LOVED this collection by Rebecca Taylor. A lot. The fabrics, patterns, designs and details were all so gorgeous. They were feminine, airy and just lovely designs and pieces for the new seasons. The layering of the fabrics worked incredibly well to create an elegant skirt design. This collection was definitely perfect for the warmer months, with a great mix of both day and evening time outfits. 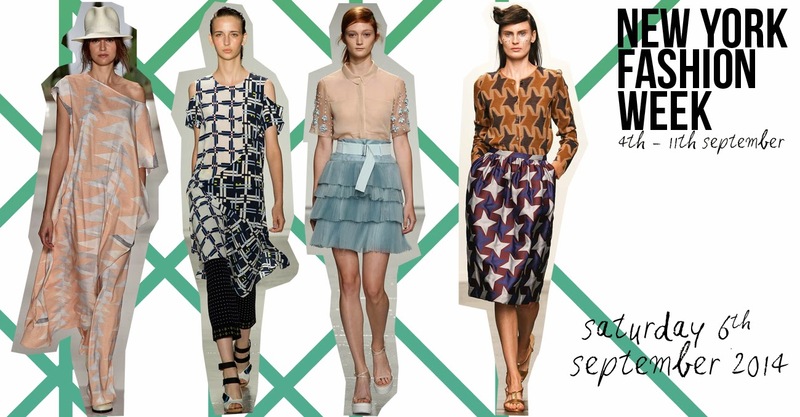 Bold graphic designs, heaps more colour and interesting designs were the call for today's shows. Around half the collections showed today had a large base of monochrome but it was lovely to see a lot more colour, and patterns, as the week progresses. I hope you enjoyed this post let me know your thoughts below. If you've seen any of hte NFYW coverage or any of the collections I'd love to know. You can watch a number of them live here as well as checking out the whole collections and more thoruough reviews on the Style.com website.